Prices mentioned for camping are based on a small camper with 2 adults and no electricity. Poland is member of the European Union. No visa needed for EU citizens. Nowe Czarnowo: Crooked Forest. Small patch of forest with a group of mysteriously bend and curve trees. Entry is free of charge. Stettin: Old city center is nice for a short visit. Torún: Old town with is and Old medieval town (Listed as Unesco heritage). Old town is very nice and definitely worth a visit. Each year, end of August there is an International Light Festival. Then the old town is lit with thousands of lights, projection and luminous works of art. Swidnica, Peace church: PLN 8 per person. Very and richly decorated church. Wroclaw, old town: Nice old town, with a beautiful square, impressive church and about 160 small goblins hidden all over the city. Auschwitz and Birkenau: former concentrationcamp. This camp played an important role in mass murdering the Jews during the WWII. Visiting these camps is a moving experience. Everyone should come here once in there life. Entry PLN 35 per person and PLN 5 per person for the headset. A guide is included and obligatory between 10:00 and 15:00. Early in the morning (before 10 am) and late in the afternoon (after 3 PM) you can visit without guide. Personally we think you should not visit without guide; you will miss out many information. The first English tour starts at 9:30. Auschwitz-Birkenau can be visited free of charge.The shuttle bus between Auschwitz and Auschwitz-Birkenau runs every half hour and is free of charge. Zakopane: Outdoor mecca in the Tatra mountains with a nice old town with traditional wooden buildings. Zakopane, Krupowski top: One of the highest peaks in the area and a popular skiing area in winter. A cable car can take you to the top (also in summer). PLN 49 for a return ticket to the top. If you want to hike down you can also buy a one way ticket. During our visit it was very crowded with long waiting time. Note that you park your car in the village. The last two kilometers is National Park and driving here is forbidden. You can walk of take a taxi or horse carriage. Parking in the village is PLN 2 per hour. Taxi is PLN 3 per person one way. Wieliczka saltmine: A Unesco site and a must see. The mine is incredible and the sculptures impressive. During our visit we saw only 3 kms which is less than 1%. Entry fee is PLN 73 per person. For taking photographs you must pay an additional PLN 10. A guide is obligatory and included in the entry fee. First English tour starts at 8:30. Krakow, Kazemierz: Old Jewish quaters. We really liked the atmosphere in this part of the town. Many interesting places here that are a reminder to the Jewish population that once lived here. Entry to Jewish temple PLN 5 per person. Krakow, former Getta: Now a part of the city, but during the war a getta. There are not much monuments left here. But is a part of the history of Krakow we would not have missed it. You can still find a piece of the former getta wall. Krakow, Factory Oscar Schindler: Factory of Oscar Schindler. A hero to the Jews in Krakow. He saved many of them buy giving them a job in his emaille factory. The factory itself is now a multmedia museum telling the story of Krakow during German occupation. It a great museum and must see. Entry fee PLN 17 per person. This is without a guide. If you want to visit with a guide you must a make a reservation 2 days in advance. Warshaw, Jewish heritage: Also in Warshaw the Jews were haunted. Also here there was a getta. Nowadays there is not much left anymore. You can still visit a small piece of the wall and several monument remembering the horrific events. In Warshaw you can also visit the old Jewish graveyard (no entry fee). Graveyard closes at 5 pm. Gierloz, Wolfsschanze: a former headquater of Hitler. An impressive, strange and even depressive place to visit. A thick forrest is slowly closing in on the ruins. Some bunkers have remained. Entry fee is PLN 15 per person. Parking is PLN 10 (for this price you can stay the night and camp on the parking). Gdansk: City in the North. The old center and Lenin Shipyard are worth a visit. We were here on sunday and it was extremely crowded. Walking through the center was no fun that day. Sopot: Very touristic village in the North. Sopot is famous for its wooden pier which is the longest of Europe. Entry fee to the pier is PLN 7 per person. Personally we did not like Sopot (far to touristic). Hel: Small fishing village located at the tip of Hel peninsula. The village itself is nothing special. If you are into windsurfing Hel peninsula is the place to be. Hel, Fokarium for Baltic seals: Entry fee is PLN 2 per person. The fokarium houses a few baltic seals. The seals are fed 2 times a day. The place is small but worth a visit. Explanations given during feeding time is in Polish. Slowinski NP: National Park on the Baltic Coast with large white dunes, up to 30 meters high. This place is stunning. We loved the scenery. Entry fee is PLN 6 per person. From the main gate it is another 6 kilometers to the dunes. You can walk or take a electrocar (PLN 15 per person one way). Miedzyzdrojach: small city on the Baltic Coast nearby the border with Germany. Like Sopot also this city has a pier. Entry here is free. If you visit the pier note all the padlocks attached to it. Miedzyzdrojach is also very touristic, but has a more local atmosphere. We liked the place. Camperarea and parking opposite of the Auschwitz museum. Price is PLN 40 for 24 hours. Showers (PLN 10 per shower) and toilets (PLN 2 per visit). Shower and toilets open between 08:00 and 18:00. Use of internet at the Information office is for free. Slowinski NP. Entry PLN 6 per person. Electrocar from entrance to the dunes (6km) is PLN 15 per person one way. Camping in Mikolajki. Good spot but we have not stayed here. Camping Kaper. PLN 57 per night (2 persons + car / no power / free showers / free wifi). Camping is a surfcamping right on the beach. It can be very crowded in high season. Camping Ekofarma. Small local campsite. Very nice spot! PLN 29 per night (2 persons/no power/showers free). The also serve breakfast here. Camping Wok. PLN 90 (for 2 persons + car/ no power). Very clean toilets and showers (free). Free wifi in the bar. Good connections to the city center. Camperarea and parking near Wieliczka saltmine. Price PLN 20 per night. Shower PLN 5 per person. Camping Ustup. Basis but very clean and friendly owner. Price PLN 53 per night (2 persons/no power/free showers). McDonalds with free wifi around the corner. Parking to the Cable car. Driving up there is not allowed as it is a National Park. From here you can walk or take a taxi or carriage. TORUN, Public parking near the old town. It is allowed to camp on the parking. Price 35 Zloty for 24 hours (no facilities). Place is safe. SUWALKI, brand new campersite near the footbal stadium. 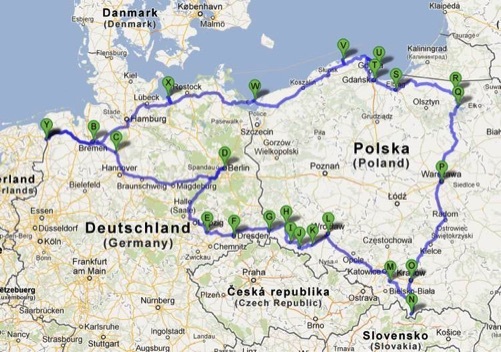 Conveniently close to the border on your way to the baltics. Place is very clean and has free wifi, and very hot showers. Price 30 Zloty for 2 persons and a car. NOWE CZARNOWO, junction to Crooked Forest. Weather: Chilly and very wet. Both periods it rained almonst the whole day.